Last time we learned that electric utility power plant boilers are vessels that are reinforced with thick steel and are closed off from the surrounding atmosphere so as to facilitate the building up of highly pressurized steam. This steam is laden with sensible heat energy, meaning it’s a useful energy, and it’s used to run steam turbines, which in turn drive electrical generators. The end result is power to consumers. Let’s now revisit our basic electric utility boiler diagram to see how water and steam flow. 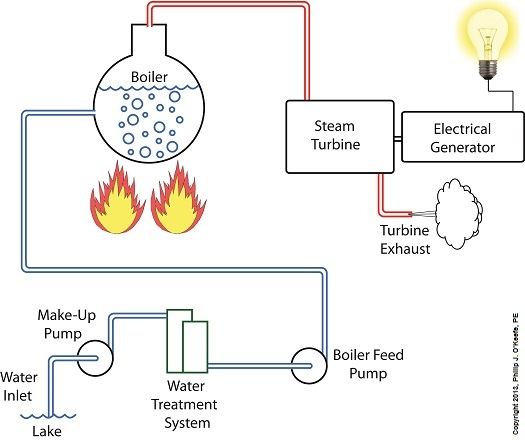 Water is fed into the boiler, heat is applied externally, and steam exits through a pipe leading to the steam turbine. You’ll notice that after the steam passes through the turbine, some of it is expelled into the surrounding atmosphere. Since water is being continuously boiled off to produce steam, the boiler must be continuously replenished with a fresh supply. This is typically supplied by a nearby body of water, hence one reason that power plants are often situated on a lake or river. Since water contains both minerals and organic matter, including algae, a treatment system to remove these contaminants must be added to the water’s inlet area before it can be used. This will keep operating parts such as the boiler and turbine free of damaging deposits. The treatment system operates much like the water softener in your home, but on a larger scale. Lake water is drawn into the system by a make-up pump, so named because it makes up, or replenishes spent water with a fresh supply. The result is clean, mineral-free water that’s delivered to the boiler by a boiler feed pump, so named because its specific function is to feed water to the boiler. Feeding water to the boiler on a continuous basis is no easy task because of the steam straining to break free, and boiler feed pumps are massively powerful devices built to accomplish this. They effectively force water into the boiler even as high internal pressures try to force the water out. This pressure is often greater than 1,500 pounds per square inch (PSI) in modern power plants. So at this point we’ve discussed the fact that the boiler requires a continuous supply of fresh water, which is converted into high pressure steam, which is then sent on to spin a steam turbine. The turbine powers an electrical generator, resulting in usable energy. If you’ve been reading along closely, you will have identified that as things stand now it’s a rather inefficient and wasteful system, a point which we’ll address in next week’s blog.